Growing up, I had a big book about the history of comics. The first few chapters chronicled the general rise of comic books, even their pre-superhero days, as well as the implementation of the dreaded Comics Code. The Comics Code was created partially because of EC Comics whose Tales From the Crypt, Vault of Horror and other horror comics were being consumed by kids on a massive scale. The problem was these comics were grotesquely violent and grim by the standards of the Eisenhower era and yet were freely marketed and sold to teen and pre-teen boys. With the Code in place, horror comics suffered a massive setback; no longer was that black-hearted, cruelly ironic spirit allowed. Clearly, George A. Romero and Stephen King, two of the twentieth century's biggest names in horror, were nostalgic for those weird, wild days. 1982's Creepshow, a collaboration between the two aforementioned artists (director and screenwriter, respectively), explicitly presents itself as one of these old-timey horror comics. It is an anthology of five stories fully in the spirit of the EC comics of the creators' youths. A frame narrative gives us young Billy whose reactionary father throws his Creepshow in the garbage, because that's what mean ol' dads do. We are then given the stories contained therein. In "Father's Day", a murdered patriarch seeks vengeance (and cake) from beyond the grave. "The Lonesome Death of Jordy Verrill" gives us Stephen King as a hick from Maine (natch) who encounters a meteorite that causes an outbreak of alien flora across his farm, resulting in a lonely death. "Something to Tide You Over" features a cuckolded Leslie Nielsen burying Ted Danson up to his neck on the beach, causing him to drown and return from the grave as a drowned zombie. "The Crate" tells the story of college professor Hal Holbrook encountering the titular cargo box and discovering a vicious monster within, which he then uses for his own purposes. And finally, "They Creeping Up On You" stars E.G. Marhsall as an cruel germophobe who gets his comeuppance via a massive swarm of cockroaches. Creepshow bring the fun and dark humor of the fifties horror comic books to life. The tone of almost laughably mean-spirited gallows humor is a rarity among modern tastes (save Sam Raimi's excellent Drag Me To Hell, which was also directly influenced by EC). Another film this reminded me of was Trick 'r Treat, which I watched last year and really liked: same anthology idea, same comic book feel, same tone. 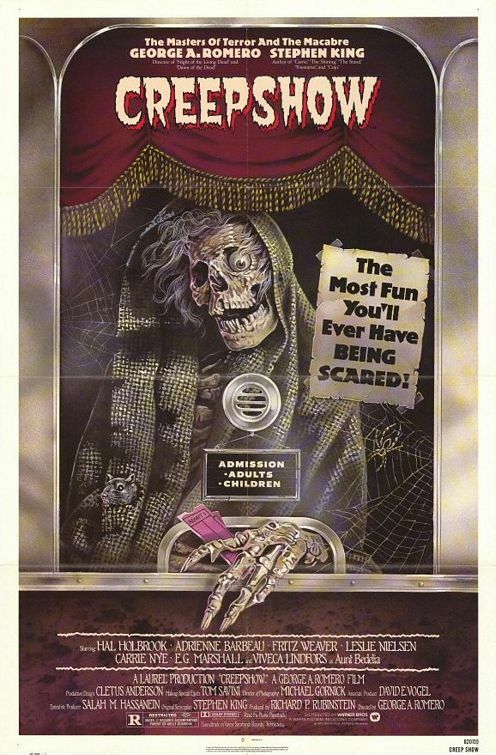 As someone who grew up reading old horror comics, Creepshow was a welcome addition to my movie knowledge. But was it scary? Not in the least, it was too much damn fun- which may have been a shortcoming now that I think about it.